If you're looking for a Marine Corps Twitter background, you've come to the right place. In this article you'll find tips and resources that will help you transform your bland, default Twitter profile into one that reflects either your own military background, or your respect for those who are in the Marines. Originally on Twitter, it wasn't possible to customize your background with your own photos. Today, Twitter provides a feature where you can choose a background image that you want to use for your profile. Most people choose a background image that reflects either their personality, or the theme of the content they distribute using that Twitter account. In just a few basic steps, you can set the background of your Twitter profile to anything you like. All you need is an image that is under 800k in either GIF, JPG or PNG format. Once you've downloaded the image to your computer, you can upload it to your Twitter account using the following procedure. Scroll down to the bottom of the page and click on "Change background image." At this point, you'll see a field where you can browse to an image on your hard drive. This is where you select an image that you've saved on your computer that you'll use as your Twitter background. You have two options, either use a single image as your background, or choose to tile the image in order to create a background pattern. While using a single image works, it can be very difficult to make it look good because a it's difficult to make a single image the right size for all people visiting your profile. Selecting "tile background" is a better approach, because if you choose an image that is a pattern with no clear border, then when you tile that same image across your background, it flows seamlessly and looks like a single large background image. Now that you know how to install a Marine Corps profile background, you're probably wondering where you can download background images that work well and are popular among Marines or military enthusiasts. The following resources offer high quality, free background images that you can download and use on your account. Shutterstock offers an amazing collection of Marine Corps images that you can use as the background for your Twitter account. All you have to do is search for "marines military" or "marine corps" and a long list of images appear. The ideal image is a pattern, but you might be able to get away with using an image of people or objects if the shading is faint and the colors are not too loud. Stay away from bright colors or distinct lines, because this will distract from the actual content on your Twitter profile. Sgt Grit at Grunt.com offers an excellent variety of large background images. 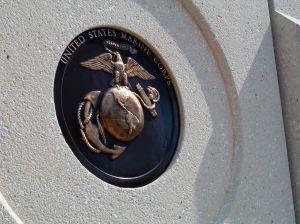 Many of the background imagery include sayings and words that are meaningful for Marines, like "Semper Fi" or "Corpsman" or simply "United States Marine Corps." MilitarySpot.com has four pages of amazing Marines imagery edited in a way that make these fantastic as background images for your Twitter profile. To download the background image, just click on the size of the file that you want to download, then right-click and save the file to your hard drive. Browse to the file from Twitter to install it as your profile background.